Molecular-sized machines could be used to manipulate significant bodily mechanisms in the future. In a recent study, scientists from Umeå University and the University of California, Berkeley have electrostatically controlled a nanoballoon consisting of a carbon molecule 10,000 times thinner than a strand of human hair, to switch between collapsed and inflated state. Inflatable balloon actuators are often used for microscopic applications, as impact protection in cars, to lift buildings or to widen narrowed or obstructed veins or arteries. In nature, spiders use micro-format fluid-filled cushions to push their legs in explosive jumps, and these nanoballoons are used as micro pumps at the micro scale. Balloon actuators are virtually unknown in the nanoscale. However, a few years ago scientists from Penn State University theoretically suggested a charge controlled nanoballoon actuator based on the inflation and collapsing of carbon nanotubes. This has been realized on an experimental level recently by Hamid Reza Barzegar and his team. In a paper reported recently in Nano Letters, the researchers have demonstrated how a carbon nanotube, which is a cylindrical tube made of carbon atoms, can be manipulated to switch from an inflated to a collapsed state and vice versa when a small voltage is applied. 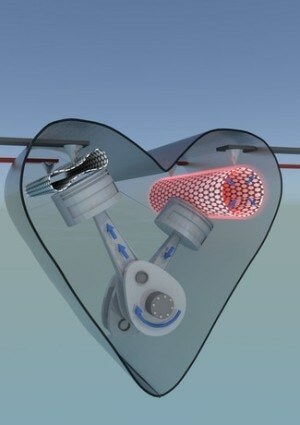 The carbon nanotubes are defect-free, ensuring that an actuator can operate without fatigue or wear. The scientists also demonstrate this by running the actuator over multiple cycles, with no signs of decline in performance. The work is conceptually interesting and gives insight into the complexity of how to control motion at the nanoscale by external stimuli. It also gives insight into fundamental physics such as how the capacitance effect and in general the electrostatic forces can be used to control the dynamics of molecular structures. The discovery of molecular machines won the Nobel Prize in Chemistry for the year 2016. The prize was awarded to Jean-Pierre Sauvage, Fraser Stoddart and Bernard L Feringa for developing molecules with controllable movements that can accomplish a task when energy is applied.